Trying to find snacks to eat to appeal to kids and that provide something of a healthier alternative is not always an easy thing to do. Kids get turned off just by the name of something if it sounds healthier a lot the time and aren’t always willing to even give it a chance of tasting good, so it can be a challenge to find something that is better than the usual snack cakes, candy, chips, brownies, ice cream and the like. 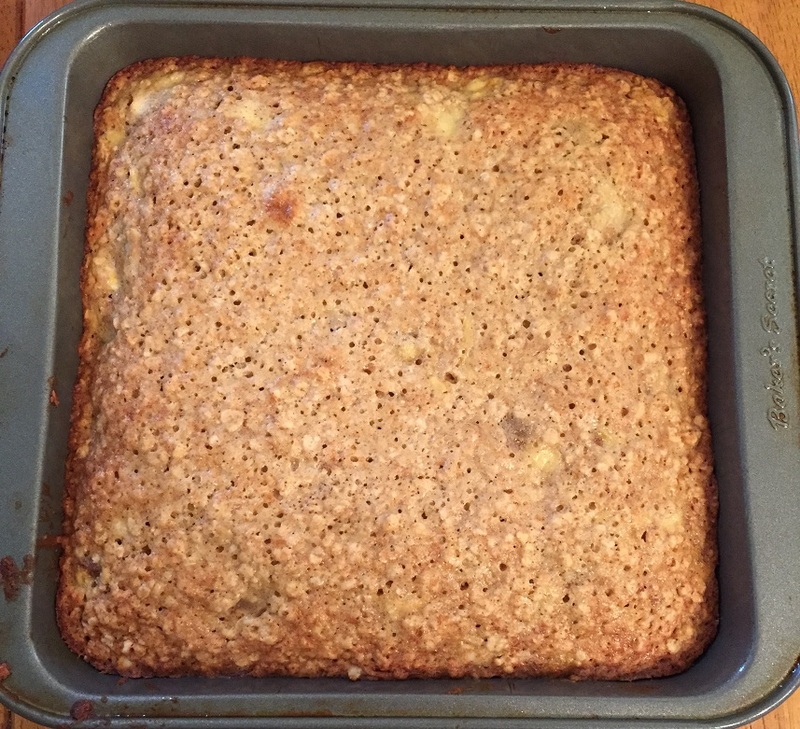 I saw this recipe recently in Bon Appetit for a banana-oat snack cake that provides a good alternative to a typical snack using some healthier choices like oats and bananas. This recipe only uses a few ingredients and can be done in under an hour to give you something quick and easy to offer as a dessert or snack after school. Preheat the oven to 350 degrees. Lightly coat an 8 x 8 inch baking dish with butter and line the baking dish with parchment paper. Whisk the oats, all-purpose flour, baking powder, cinnamon and salt in a large bowl and set it aside. Whisk the brown sugar, eggs and vanilla in another large bowl until the mixture is smooth. Slowly stream the butter into the brown sugar mixture, whisking constantly until the mixture is well blended. Add the bananas to the dry ingredients and toss the bananas to coat them well. Stir the banana mixture into the brown sugar mixture. The resulting batter will be quite thick. Spread the batter evenly into the prepared baking dish. Place the dish in the oven and bake until the cake is golden brown and the edges start to pull away from the sides of the dish, about 35 to 40 minutes. Transfer the cake to a wire rack and let it cool completely in the dish. Cut the cake into 12 servings and serve. The resulting cake has great flavor from that oats and bananas with a nice hint of cinnamon throughout the cake. I think it is a great snack cake and it stayed quite moist for the few days we had it around the house, making it the perfect after school snack. it also goes really well with your coffee in the morning if you are looking for something a little different for your breakfast and it certainly is a great dish that you could add to any breakfast buffet or lunch or something you can throw together easily if you have some last-minute guests drop by and want something tasty to serve over coffee. That’s all I have for today. Check back next time for another recipe. Until then, enjoy the rest of your day (we have a snow day here in our area of New York today) and enjoy your meal!